Visit the UVEF FACEBOOK page. 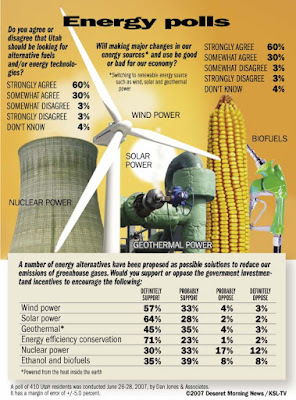 Polled residents want to fight global warming"
A very encouraging article appeared recently in the Deseret Morning News. I strongly encourage you to read it. At left is a graphic that summerizes some of the findings of an important recent poll. <<-- Click on the graphic to ENLARGE it. And click HERE to read the rest of this informative article. Our full WEB SITE is UVEF.org. To join, email us at join@UVEF.org. Click the "donate" button to 1) contribute or 2) to pay membership dues by either major credit card or PayPal (adult = $10/yr, student and senior = $5/yr). Business memberships are also available. Please inquire if interested. FO•RUM |`fôrəm| noun 1. a place, meeting, or medium where ideas and views on issues can be exchanged. MEETINGS: We are now hosting our monthly FORUMS at the Orem Public Library, normally on Wednesdays. See the green events calendar at our regular web site: UVEF.org. • The URL of this web site is UVEF.ORG. TO JOIN THE UVEF AND/OR OUR EMAIL LIST: Click HERE to send us an email with your request to join. • To do community service, educational and other kinds of outings and events to improve the quality of the environment and to educate and enlist the public in helping improve, restore and protect the health and well-being of the earth. We're told it's most effective to write actual letters to the Governor and your congressmen (and to use their local addresses) as opposed to using email, or weblinks. Below are the LOCAL mailing addresses and Provo office phone numbers for our congressmen. Click HERE if you seek a response. Click HERE if you don't need a response.